Born in 1970 in Cape Town, South Africa. Lives and works in Cape Town, South Africa. Melanie Cleary is an award winning photographer and one of South Africa’s most well known commercial portraitists and particularly for her photographs of children. She is self-taught. She was a well-established specialist technician in the South African Film Industry when she suffered a minor injury. Instead of taking time off to recover, she offered to become the on-set photographer. She had no experience as a photographer but she understood the dynamics and demands of a film set environment; she made herself completely invisible. That was in 2001; she recovered from her injury but decided not to return to her former department. She continued only with photography and working exclusively on film sets. By 2009 she felt ready to launched her debut solo exhibition with a portrait series of participants in natural body-building competitions. She had accidentally walked into a body building competition in a town hall in Cape Town. She was given permission to take a few photographs. She returned the following week and then continued to document the sport across the Cape Peninsula for three years. She titled the series The Hero Within. Her following series, New Years Day was photographed in Durban, South Africa on 31 December 2011 and 1 January 2012. I always knew it was going to be a tough assignment - but that was the challenge I had set myself. I wanted to take beautiful portraits but I also wanted to capture the ethos of this annual ritual. Hundreds of thousands of visitors are known to come together annually to usher in the New Year on the beaches and the pools of Durban’s North Beach. Cleary’s inspiration for most of her projects is found at unexpected moments and places. A series of small undated, black and white contact sheet prints, framed and installed in the foyer of one of South Africa’s oldest special needs children’s homes became the inspiration for Another Day. The body of work took four years to complete. Clearly notes, “The title of this series describes the mood I wanted to capture. I did not want the kids to perform for the camera. I took lots of photographs, I showed them the shots on my screen. We had great fun. I wanted the novelty of seeing me with a camera to wear off. 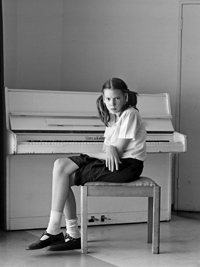 The final portraits included in this series, were all taken with my film camera and shot in black and white.” Piano Girl (illustrated) was launched at Photo LA in 2012 where the edition sold out. Visitors to the fair rated the photograph as one of the best images on offer.